OK folks, no waffling, no hyperbole... I'll get straight to the point. 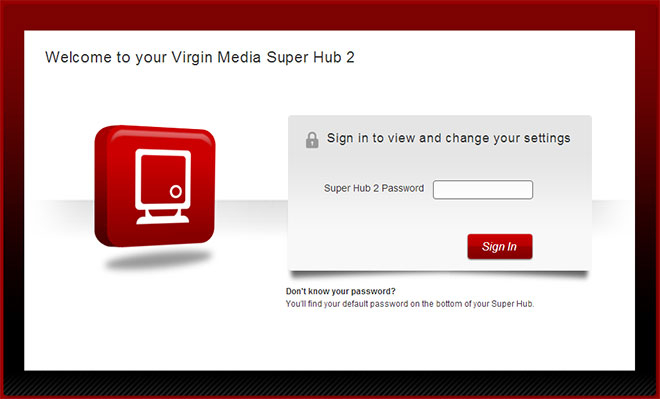 If you run a Virgin Media SuperHub or Superhub 2, your network is not secure. When you switch on your device, it takes roughly a minute to fully boot, bring up the network cards/WiFi and start the DHCP server; needed to assign an IP to each device wanting to connect. During that time, the device brings up the WiFi card without any form of encryption. As you can see, there's a 7 second window of opportunity for anyone within WiFi range to connect to your network. How many other wireless networks can you see from your home? Chances are, they can see yours too. Big deal, what can they do in 7 seconds? At first glance, you'd be forgiven for thinking an attacker couldn't do much damage with such a short window. You'd be wrong. Virgin's SuperHub and SuperHub 2 have several constants which an attacker can use to break into your network. The device listens on two IP addresses by default. 192.168.100.1 and 192.168.0.1. The default password is "changeme" - and very few people change it, or even know how to change it. This should be a vital part of the setup process - the device should not function until this has been changed, in my opinion. With those two pieces of information, an attacker has everything they need to gain access to your network. Once logged in, they can access your router's UI (user interface). Ah wonderful... there's our WiFi encryption key in plain view. An attacker can simply note this down (or store it if the attack is automated) and wait. Your 7 seconds are up, we're packing WPA2 encryption now! After the 7 second window, the router takes the WiFi card offline, enables encryption and brings the card back up. That'd be great, if we hadn't already broadcast the encryption key to everyone nearby. That's akin to reading your password aloud, while you change it. I keep my router on 24/7 - so I'm safe. Actually, you're not. Using just a few lines of code, it's possible to force the router to reboot remotely. I can (and have with prior permission) sat outside a property, forced a router to reboot and simply waited for the golden 7 second window to arrive. He'd changed his WiFi password too. Unfortunately, he'd used the same password for his email... so I had access to that too. Sure it's tricky, time-consuming and far from 100% successful but it really does put home router security into perspective. Remember, this is spreading over WPA2 encrypted networks. If someone is using my network, what can they actually do? What ever they like, within reason. Alter DNS settings; redirecting genuine websites to fraudulent versions, browse your hard drives, intercept emails & internet traffic, harvest usernames & passwords, install key loggers, use your printer, enable your webcam, install remote administration tools to watch you as you login to online banking etc... the possibilities are endless. There's a wider issue here too. What happens if they access illegal content, pornographic material or abuse Virgin Media's network? The authorities go after the owner of the broadband connection! You'd have to be asleep to miss such a glaringly-obvious flaw - but it seems nobody at Virgin Media or Netgear (who build these routers) spotted it... so I contacted Virgin's infamous technical helpdesk. After going through the inevitable and mind-numbing script, I eventually manage to reach Virgin's Security Engineering Manager on January 27th 2014. Less than 24hrs later, his team had tested and replicated the issue internally. Say what you will about the exploit, that's very impressive! Unfortunately though, firmware patches take time... so Virgin really are in Netgear's hands here. After a couple of weeks, I checked in to see if there was an update. No such luck... with a fix estimated in months rather than weeks/days. If they've confirmed it and are working to patch it, why publish now? A lead time of 3-6 months really isn't great (it's disgusting actually, but moving on...), but that's not the reason for my decision to publish this information now. You can limit the impact and severity of this exploit simply by changing your router's default password. An attacker will still be able to connect when there's no encryption, but crucially, they won't be able to grab the encryption key needed to gain access beyond that point. Visit http://192.168.100.1 in your browser. Login as usual. As you know, the default password is "changeme". Scroll down to "Device Management" -> "User Interface Management"
Enter a new password and hit "Save". 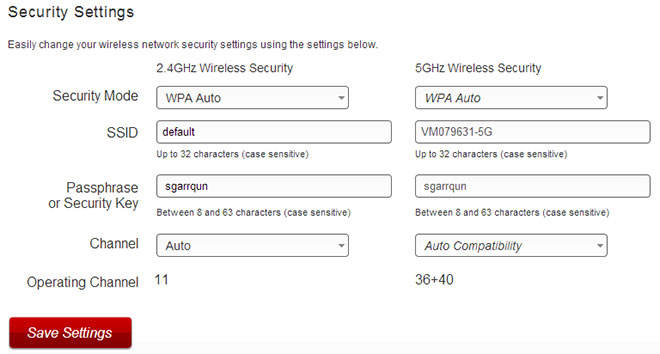 Enter a new "Passphrase or Security Key" for both the 2.4 & 5Ghz networks. You'll need to enter this new key into each wireless device to restore your connection. A simple but effective solution and in the absence of a firmware upgrade, that's really all Virgin Media needed to tell you. Had they done so, you wouldn't be reading this. Instead, it's been radio silence (pun intended)... so now it's down to you. If you think you may have been affected by this exploit or need assistance to reconfigure your router, drop me an email. Please remember to Like, +1 and RT. Thanks. Previous Post cyberstreetwise.com - Really bad #infosec advice. Next Post Council Tax, PCN & Benefits Payment Data Leaked! Are you affected?